The Environment Agency is warning landowners in Yorkshire and Lincolnshire to beware of illegal waste operations that may cost them thousands in clean-up costs. The warning comes after investigating officers at the Environment Agency discovered large-scale tipping of waste at sites in Yorkshire and North Lincolnshire without the required waste permits being in place. In a series of incidents, a waste operator has negotiated access to land by signing leases for their use. Once the operators had access to the land, they dumped waste, and then they disappeared - leaving the landowners to face the clean-up bill. In recent weeks, waste has been dumped at six sites across Sheffield, Rotherham, Leeds, and Brigg. Most of the waste is wrapped in bales, using green or black plastic, although one site has seen 100 containers of liquid left behind. In total the clean-up costs could be close to £1million. Any person or business who transports, treats, stores or deposits waste without the required environmental permits is breaking the law. And if waste is left illegally on any land, the responsibility for removing it can fall to the landowner or property landlord. 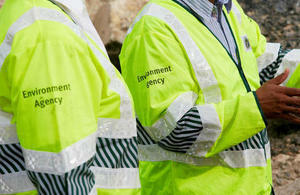 Don’t take an operator’s word for it: if they say they have an Environment Agency permit, then check with us. Either call our customer contact centre on 03708 506506 and give the name of the company, or check our public register on our website. Landlords may be keen to rent out land as quickly as possible, especially if it has been out of use for a while, but if they don’t make the proper checks, they could end up much worse off. Illegal waste activities pose a significant threat of harm to the environment and local communities, and they also undercut legitimate businesses that comply with the rules. It is important that everyone plays their part in stamping out waste crime. Anyone who believes any illegal waste activities are taking place is urged to report the matter to the Environment Agency’s incident hotline on 0800 807060 or CrimeStoppers on 0800 555111.